The International Festivals & Events Association (IFEA) recognized the most outstanding examples of quality and creativity in the festivals and events industry on September 14, 2017 at the IFEA's 62nd Annual Convention, Expo & Retreat in Tucson, Arizona, U.S.A. as it announced the winners of the 2017 IFEA/Haas & Wilkerson Pinnacle Awards. Sponsored by industry leader Haas & Wilkerson Insurance, the professional competition draws entries from among the world's top festivals and events. 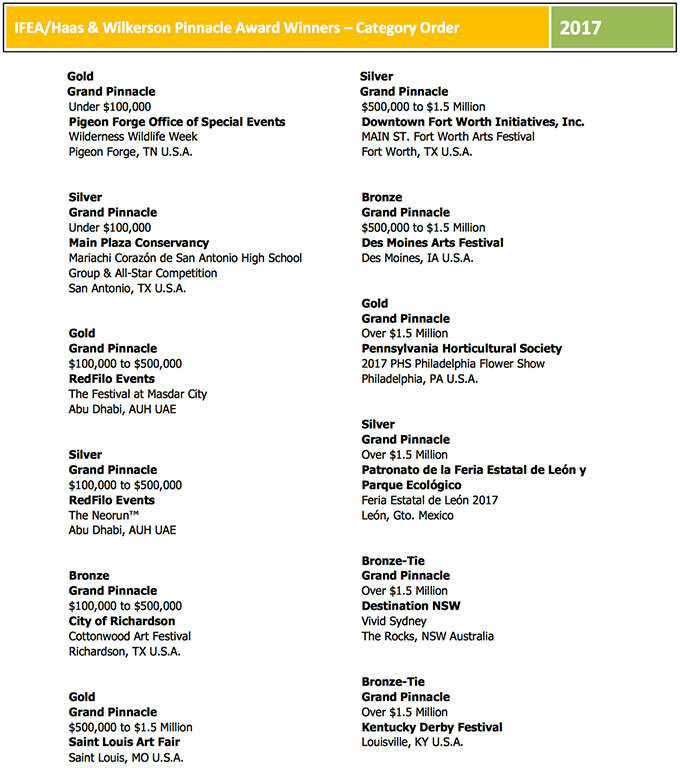 Winning entries came from organizations as diverse as the 500 Festival in Indianapolis, IN; the Des Moines Arts Festival, Des Moines, IA; Riverbend Festival in Chattanooga, TN; Rutgers University in Piscataway, NJ; the National Cherry Festival in Traverse City, MI; the Philadelphia Flower Show, Philadelphia, PA; the Fiesta Bowl, Scottsdale, AZ; the Sausalito Art Festival, Sausalito, CA; the Skagit Valley Tulip Festival in Mount Vernon, WA and Celebrations Ottawa in Ottawa, ON, Canada. International contenders included such diverse event organizations as the Singapore Garden Festival in Singapore; RedFilo Events, Abu Dhabi, UAE; Destination NSW, Sydney, Australia; The Third China International Circus Festival, Guangzhou, China; Feria Estatal de Leon, Leon, Mexico; Ludwig Van Beethoven Easter Festival, Krakow, Poland; Cuckoo Events, Dublin, Ireland; Rotterdam Festivals, Rotterdam, Netherlands; Festival Lent, Maribor, Slovenia and the Ansan Street Arts Festival, Ansan, South Korea. Awards were handed out in 71 different categories in total including Best TV Promotion; Social Media Site; Commemorative Poster; Sponsorship Program; Green Program; Parade; Educational Program, Children's Program; Social Media Campaign; Merchandising Program and Festival & Event Management Degree Programs in addition to the highest award given by the IFEA in recognition of those Festivals and events who have a balance of all the elements necessary to ensure a successful event - the Grand Pinnacle. "We would like to congratulate all of our Pinnacle winners for their outstanding entries into this year's competition," said IFEA President & CEO, Steven Wood Schmader, CFEE. "The IFEA/Haas & Wilkerson Pinnacle Awards Competition recognizes the outstanding accomplishments and top quality creative, promotional, operational and community outreach programs and materials produced by festivals and events around the world. Striving for the highest degree of excellence in festival and event promotions and operations in every budget level and every corner of the globe, this competition has not only raised the standards and quality of the festivals and events industry to new levels, but also shows how event producers can use innovation and creativity to achieve a higher level of success." Click for a complete list of IFEA/Haas & Wilkerson Award Winners. Copyright 2017 International Festivals & Events Association (IFEA). All rights reserved. From http://www.ifea.com.